"These waters have acquired a national reputation for curing Bright's disease of the kidneys, rheumatism, all diseases of the liver, and blood. Correspondence solicited." In remembrance our founder, who recognized the value of our precious water, we reprint his obituary as it appeared in the Pueblo Chieftain January 7, 1904. Pueblo Chieftain 1-7-1904 - Silas J. Clark, one of the oldest pioneers of Pueblo, died at his home, 17 block U, at 9 o'clock last night after a continued illness of a complication of diseases. He was 87 years, 7 months and 29 days of age at the time of his death. For the past 24 years he has been prominently identified with the upbuilding of Pueblo and was considered one of the principal factors in the city's growth. Silas J. Clark was born in Union village, Washington county, New York, May 7,1816. He was of Puritan Scotch decent and many of his ancestors stepped foot on American soil from the deck of the Mayflower. During his earlier years he removed with his parents to Detroit and spent the greater part of his boyhood days there and in Chicago, both then being little more than villages. At the age of 29 years he was married to Miss Lorene Stebbins, of Mosiertown, Pa.
From his early youth Mr. Clark showed exceptional business proclivities and each one of his business dealings was pushed to completion with great sagacity. During his earlier years he engaged successfully in the dry goods business, but finally entered the oil fields of Pennsylvania, where his dealings were practically all brought to a successful climax. In 1873 he came west and engaged in the mining business in Clear Creek county where he secured some of the most valuable mining properties in the state. The following year he moved his family to Denver and for six years prosecuted his mining deals from that point. But the oil fever was so strong in his veins that it was not long before he began to look around for an oil location. His experience in the oil fields of Pennsylvania led him to believe that oil existed in this country and he decided to sink a well. 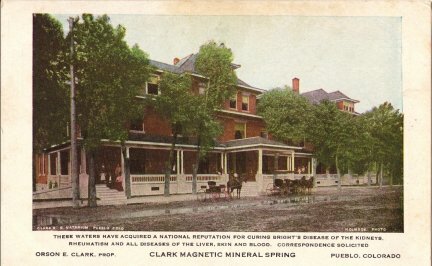 Pueblo, which was then a town of about 6,000 or 7,000 inhabitants, was chosen as the proper location and he began drilling on the site of the now famous Clark wells. This was during the latter part of the year 1879 and about the first of January 1880 water was struck in the well. This, however, was not what he wanted and he kept sinking the drill to such a depth that he finally discovered that there was no oil to be found there. This was the first artesian well drilled west of the Missouri river. The discovery that the water contained medicinal properties was by accident. One of the drillers working on the well was one day seized with a severe kidney trouble and for several days he suffered greatly from this disease. When the water was struck, the man who was afflicted with the kidney trouble began drinking it, though the others did not, as they said it was not palatable. After drinking the water continually for a short time the man with the kidney trouble was entirely cured. Some of the other drillers became afflicted with disorders of some kind or other, and they, too, began drinking the water with the result that they were also cured. 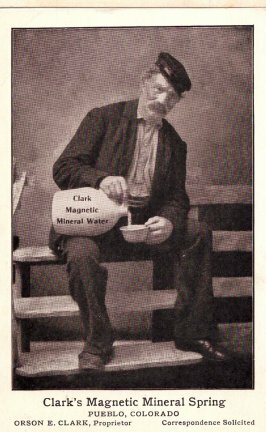 This led Mr. Clark to investigate the ingredients of the water and he finally discovered that it was highly charged with mineral and medicinal properties. The first bath house on the site where the large and commodious sanitarium now stands was built about June 1, 1880. It was patronized by the residents of the city, but not very extensively. In 1884 the old bath house was remodeled and steam fixtures were put in. The well then became known throughout the state and was visited by many afflicted with rheumatism and other diseases of the system and finally became known far and near as the Mecca for all troubled with rheumatism, kidney trouble and various other diseases. The well is now famous throughout the west, and a few years ago a large modern sanitarium was built. About six years ago, being old and rather broken in health, Mr. Clark decided to sell the well and retire from active business life. C K Wolfe bought a half interest and the son of Mr. Clark, 0. E. Clark, are now the proprietors of the well and sanitarium.